Our world is becoming more mobile with each passing minute. On a daily basis, myriads of people utilize an Android, Windows, or iOS tablets to accomplish all of their computing needs. As the capabilities of these mobile platforms increase, these devices may even become our primary tools for computing. There is one place where these types of devices seem to fall short though: in the realm of keyboard input. Most on-screen touch keyboards don’t provide the level of tactile feedback that many feel is so rewarding on a conventional keyboard, so how do we tackle this intrinsic problem? This is where Bluetooth keyboards come in. Bluetooth keyboards provide that classic keyboard feeling, yet are just as portable as your favorite tablet. The amount of Bluetooth keyboards available on the market is increasing, so we’ve thinned the chaff a little and come up with the three best units that are available today. We’ve also included a device that’s perfect if you’re ballin’ on a budget. Logitech has been manufacturing quality, reliable computer peripherals since 1981. Originally specializing in the production of mice, in 2008 Logitech hit the milestone of one billion mice manufactured since 1985. Over the years, Logitech has broadened its product lines to include standard and Bluetooth keyboards as well as a bustling line of computer speakers. Our Gold Pick is a much beloved product from this exceptional company that takes the wireless input industry to new heights. To start, you might notice that this keyboard has a very interesting feature along the right side of the unit: a full mouse touchpad, complete with right and left click buttons. This is an excellent feature for when you need to compute on the go or even from your couch. The pad itself is 3.5-inches and it features multi-touch capability for easier browsing. Logitech did a great aesthetic job with this touchpad, as it sports cool-looking lines that criss-cross the surface at varying angles. The clicking buttons are not equal in size; the right click is somewhat smaller than the left click, but both of these buttons are responsive and have good action. Being the only device of this type on our list that wasn’t really designed with compatibility with Smartphones and tablets in mind (though you can still connect up some of these devices), this device still has a lot of intended connectivity. If you’re looking to manage a large media library that is housed on your computer, but is accessed for viewing on your Smart TV, you can easily hook this keyboard wirelessly to your big screen and browse right from the comfort of your couch. The keyboard comes with a USB dongle for direct Bluetooth connection, so connecting up to your Acer Iconia or directly to your home PC is a very easy and intuitive process. As a media device, this keyboard excels. For comfort, you can even utilize left click functionality from the left side of the keyboard area; this makes it easy to click even when you are prone and surfing/watching on the couch. In addition to this click option, there are three media keys that will let you control the volume level of your video/audio experience; these include an up volume button, a down volume button, and a mute. Since this is designed to be an option for those who want a more on-the-go form factor than is typically provided by standard keyboards, Logitech built this keyboard with portability in mind. It’s dimensions are thusly, understandably miniscule; it measures in at 5.3 inches in depth, 13.9 inches in width, and 0.9 inches in height. It also only weighs in at 12.6 ounces, which will make it very comfortable to type around on your lap. When it comes to everyday functionality, the keys on this unit stand out well and feature white colored characters atop jet black keys. The keys also have whisper-quiet operation that makes them perfect for not disturbing others who may be in your near-immediate vicinity. The wireless function has a range of 33 feet, so you will be able to use this from relatively far distances. While this keyboard does rely on AA batteries for operation, it has an astounding 12 month battery life that won’t see you needing to hot-swap when you have a lot to write. Looking for an even smaller form factored keyboard than the one we’ve selected as our Gold Pick? Well look no further, as this is a downright tiny keyboard that’s been designed by QQ-Tech as a great, super-portable option for fans of mobile devices. As mentioned, this is a very small keyboard. As a matter of fact, it’s almost TV remote sized in measurement. These measurements are: 9.1 inches in width, 5.9 inches in depth, and 1.4 inches in height. This tiny keyboard is also very light; it only weighs 4.8 ounces. For many users, this slight form is perfect for typing up a text message on the go or interfacing with a smart TV; as a matter of fact, this device is the perfect accompaniment for a Smartphone because their sizes are so similar. From an aesthetic perspective, this is a very unique looking device. It has small Blackberry-like keys, a hexagonal grip design, and orange, textured edge caps. Along the bottom of the unit, you will find the micro-USB port that will allow you to charge the keyboard when it needs more juice. This device is also very solidly constructed; you can definitely carry it around in your bag without worrying about its condition. Despite the small profile, QQ-Tech was able to include a lot of functionality in this keyboard. Just like our Gold Pick Unit, this Silver Pick keyboard incorporates a fully functional touchpad into its design. Also just like the Logitech keyboard, this touchpad incorporates multi-touch design into its functionality. To ensure that this device would work well with all platforms and OS’s, QQ-Tech included a dedicated right and left mouse click combination and a directional pad that doubles as page up and page down buttons. If you want a less cumbersome clicking experience, we recommend utilizing the additional right and left click buttons that you can find along the sides of the device. Unfortunately, while the keyboard works fine on iPhones and iPads, the touchpad isn’t compatible and will not function on iOS devices. Above the dual-duty function/number keys, you will find a series of media and feature keys. These include keys for the controlling of your media content; not only volume buttons, but options that will control every aspect of your media file’s playback. This is particularly useful if you intend to use this in conjunction with a smart TV or home theater PC. Aligned on the far left of these media keys you will find a key that has an illustration of a sun printed on it. This is the backlight key. Amazingly, QQ-Tech included this functionality for low-light situations and it works like a charm. In addition to these media controlling keys and backlight button, you will find the Bluetooth button that will allow you to pair with any of your devices. This is very useful as easily connecting devices, even cross-platforms will really make this something of a controls-all device; a very unified approach to modern electronics. 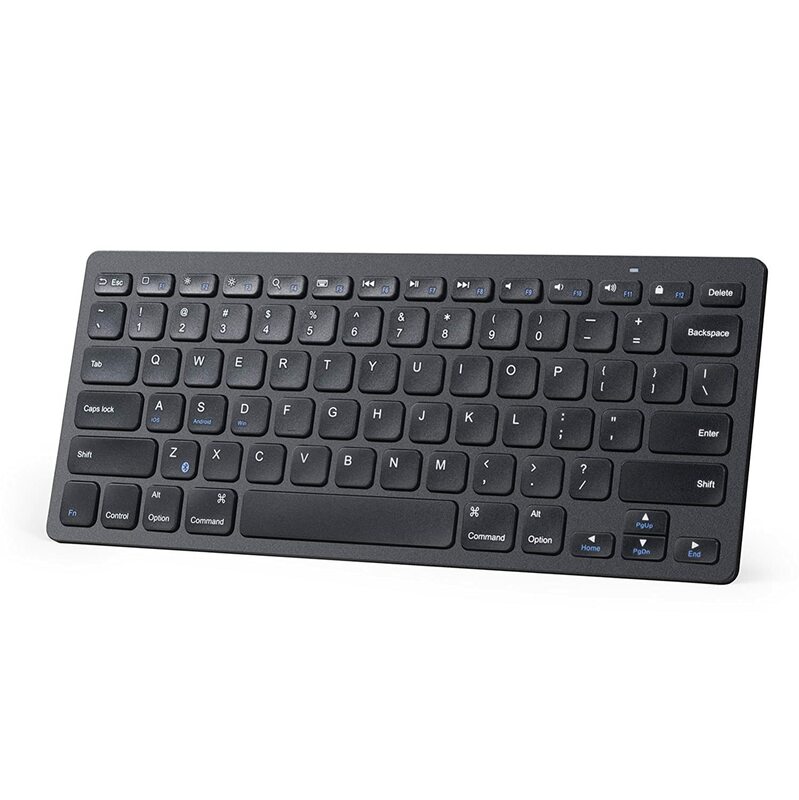 Another Bluetooth keyboard by computer peripheral manufacturer Logitech, this unit serves as a great compliment to many of the mobile devices that are available today. Unlike our Gold Pick offering, this is definitely a device that has almost every available platform in mind. Want to hook it up to browse the net on your smart TV? No problem. Want to surf on your Android Tablet? This is done easily. What about iOS devices? This can connect to them. How about Windows Phone? Well, that’s the one exception. One of the first things that you might notice with this keyboard is the bright yellow tray that’s positioned along the top of the unit. This tray is a neat little feature that will allow you to better manage your portable gadgets. Since not every tablet or Smartphone comes with a kickstand, this plastic tray will let you place these types of devices in the slot and allow you to work them like a laptop. There’s plenty of room in this tray for a couple of Smartphones or a Smartphone and a tablet, so Logitech did a great job on real estate. Why would you need room for multiple devices on the body a Bluetooth keyboard? This is where the large three position knob that’s aligned along the left of the keyboard comes in. This knob will allow you to connect three devices simultaneously and connect to each with a spin of the dial. This is an excellent feature that will allow you to type up a document on your PC, shift the dial and hit pause on the track on the version of Spotify playing on your tablet, and move the dial one more time and use the keyboard to start up the Youtube video that you had Queued up on your Smart TV. This functionality is rare and it really will help you unify all of the different ways that you do your personal computing. Size-wise, you’ll notice that this is a mid-sized keyboard. Logitech actually produced this device to be a main PC styled keyboard that has mobile applications. Its measurements are 12.2 inches in width, 1.6 inches in height, and a somewhat large 7.9 in depth, all of these dimensions make it slightly larger than our Gold Pick and much larger than our Silver Pick entry. In totality, this keyboard weighs a semi-hefty 1.8 pounds. As per its design, the keys are very responsive and feature a Chiclet-style shaping that while they aren’t durable enough to be stored willy-nilly in your bag, can take a bit of punishment. Also, for the cost of a couple of AA batteries, this keyboard will last for two years. While many of the additional feature-packing Bluetooth keyboards on the market today can cost in the $40 to $50 range, that doesn’t mean that a great, standard styled Bluetooth keyboard can’t be purchased for a fraction of that cost. Anker has done an excellent job providing a sturdy, stable, and small form factored keyboard that will give you all you need without breaking the bank. Admittedly, this keyboard isn’t feature rich, nor does it sport a very breathtaking design, but neither of these shortcomings mean that this keyboard doesn’t perform its role well; the connection is fast with very little input lag, the keys are responsive and well articulated, and they keyboard is very portable with a weight that is only 6.7 ounces and a size of 11.2 inches in width, 4.8 inches in depth, and a very flat-seeming 0.7 inches in height. 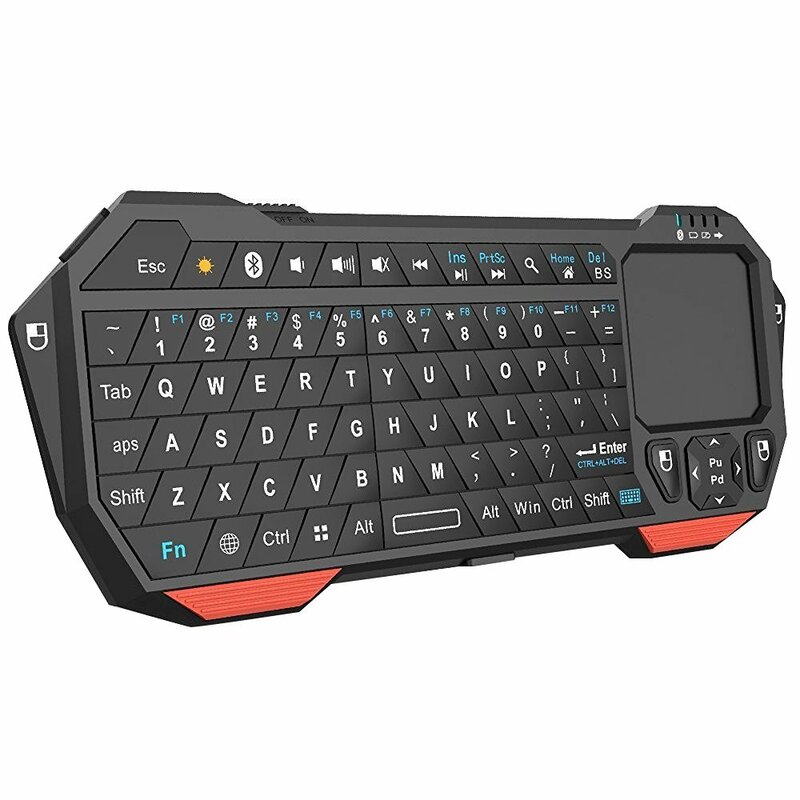 While you won’t get a dedicated num pad with this Bluetooth keyboard, you will find a full set of function keys aligned with the top of the unit. These function keys also double as media keys, simply press the Fn button set near the Ctrl Key. These media control buttons will allow you to affect various media playback settings and are fairly responsive. With such a relatively nondescript design aesthetic, the one design concession that Anker opted to make is the presence of their logo, which is emblazoned across the right side edge of the spacebar. Touchpad – This is a great feature for any connected device. It will allow you to utilize a mouse interface on many mobile devices including laptops, tablets, and Smartphones. This is particularly useful if you don’t have a Bluetooth or wired mouse. Media Keys – This is a feature that manufacturers have been including in keyboards for some years now. Media keys allow you to interface directly with some media programs and apps, such as Spotify, Windows Media Player, and iTunes and control their playback functionality via keys that allow you to play, pause, fast forward, or rewind. Physical Docking Capabilities for Smartphones and Tablets – This is particularly useful if you find yourself interfacing with your Smartphone or tablet. Some of these types of keyboards have the ability to magnetically adhere to your tablet and form a smart cover to protect your screen. Others, on the other hand, have slots housed in their construction that will allow you to manually insert your mobile device. There are many systems for many devices currently available on the market, so execute due diligence when selecting a device. Connection Swapping – If you find yourself connecting to multiple devices when you use your Bluetooth keyboard, this is a particularly useful feature. Keyboards with this functionality will allow you to select the device that you want to interface with directly from the keyboard itself. This is usually accomplished by turning a dial or utilizing an on-board LCD interface. Nothing is more frustrating than typing a full sentence only to find that you are missing a keystroke somewhere in the middle. Keys should be responsive and have enough action that you know when you have struck them. As a rule, the more action that your keyboard’s keys provide, the thicker it will be; this thickness will directly correlate with how portable your keyboard is. The key to finding a great Bluetooth keyboard is in finding one that has enough action and sensitivity to be portable yet responsive to your input needs. Do you have a Windows-based media laptop, an Apple desktop, and an Android tablet? If you have this degree of cross-brand computing options, you might want a Bluetooth wireless keyboard that can connect to all of your devices, no matter what the platform. Imagine being able to control your laptop that is connected via HDMI cable to your Ultra HD TV from your couch or completing the final mark-up edits to a document from the same couch on your Nexus tablet. Some Bluetooth keyboards will let you have this degree of functionality. As our choices broaden when it comes to which platforms we use, it’s good to have a versatile interface that takes them into account. When selecting a new Bluetooth keyboard, be sure that it will be able to interface with all of your electronics. If you are planning on doing a little writing from the confines of your favorite Starbucks, you don’t want your band new Bluetooth keyboard to conk out on you in the first half hour. As wireless devices, these types of tools are completely beholden to the current level of battery technology; and as a result, these things won’t run forever on a 20 minute charge. Also, if you select a keyboard that relies on batteries, you might want to have a selection of AAs on hand, just in case your batteries die. For many, this is a drawback because having to rely on a steady supply of batteries does tend to decrease that feeling of mobility significantly. 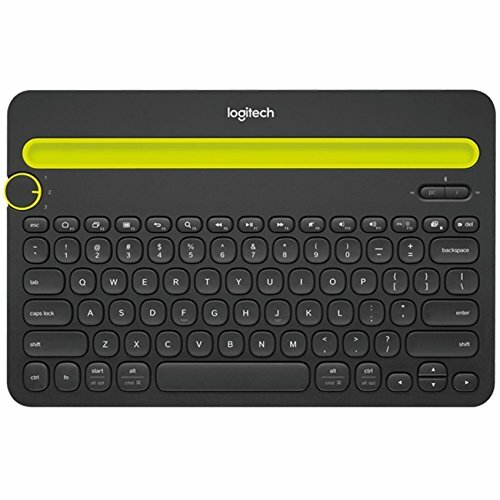 For those types of Bluetooth keyboards that provide a sort of stand for your tablet, what angle your device is presented in when connected is a major consideration when purchasing one of these. Some of these types only present one angle of presentation and that may work sometimes, but when you are sitting in different positions, this angle may be counterproductive. Try to find a Bluetooth keyboard that presents a wide variety of angles for the purpose of your computing experience, this will ensure that you have the most versatility possible. Connectivity and ease of input are the names of today’s modern tech-oriented game. The Bluetooth keyboard provides both of these functions to the sometimes hard to interface world of mobile computing. The list of picks, gold through budget, hopefully will provide you with some great keyboard options that will help you navigate the digital world, but they are not the only ones on the market. If these aren’t your cup of tea, definitely utilize our list of pre-purchase considerations to help you find a Bluetooth keyboard that will work for you.